Address: 76 Southampton Row, London WC1B 4AR. Summary: This shop is genuinely superior and is also a genuine "one off". 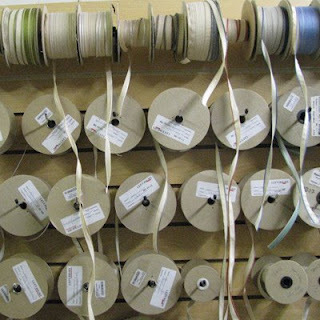 I can't think of another shop which combines their range and quality of fine papers together with a comprehensive supply of bookbinding materials. Last Friday I visited - and photographed - the Shepherd Bookbinding/Falkiners Fine Paper shop at 76 Southampton Row, London WC1B 4AR. You can see a slideshow of the photographs I took on Flickr. Click the 'info' (top right) to see my description of every image. This post is a review of what the shop has to offer. I'm never quite sure what to call them - and I've decided they're Falkiners on the ground floor where the paper is and Shepherd's in the basement where the bookbinding supplies are. 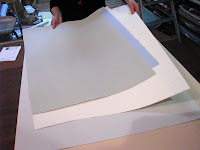 It's getting progressively more difficult to find fine paper in a shop in London. A number of suppliers are switching to focus more and more on student supplies at the cheaper end of the range and/or are restricting their range. 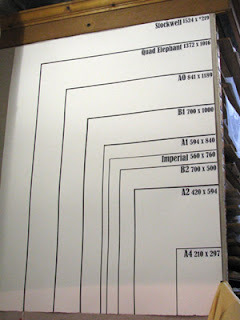 It is therefore a complete joy to go into a shop like Shepherd/Falkiners and find shelves and shelves (and shelves) of paper! The way the shop works is that you review the selection on offer in the boxes at the browing cabinet. You make a note of what you want, hand that to one of the members of staff and they will retrieve the paper from the floor to ceiling shelves at the back of the shop. One thing they don't stock is illustration board. I'm still trying to find a shop in London which does! Watercolour Paper - They have a good range of quality watercolour paper - including Shoellershammer 4G 250gsm and Two Rivers Handmade. Interestingly while I was in the shop, there was a chap at the counter who was picking up a range of paper (pictured on the right). 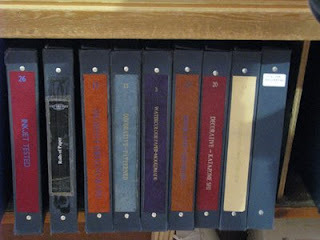 It turned out that these are all set to reappear on a television screen near you next year when they will downsized and used as the papers for various letters in an episode of Poirot on ITV! This shop has the best range of effective and/or archival adhesives that I've seen in a very, very long time. Check out the adhesives page on their website - it's enough to make those who appreciate the differences between different types of adhesive drool! Downstairs in the basement are all the adhesives for bookbinding - together with the Japanese paste brushes. 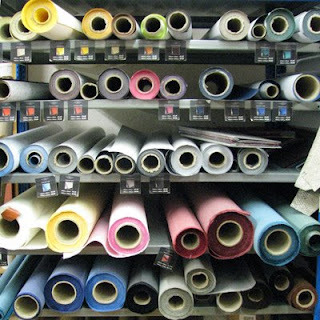 Upstairs are a variety of starch adhesives and a jolly good range of acid-free hanging tapes from LineCo which is an American company which does mounting and framing supplies (but which does not have an ecommerce site). It was great to be able to see the gummed Japanese Paper Tape which is amazing but almost impossible to find. I bought a roll of the Self-Adhesive Line Hanging Tape (see end). Essentially the shop has just about anything you might need for document repair and conservation. The bookbinding supplies can be found down in a large and well lit basement - where there's also a very helpful guy who provides informative answers to questions. Interestingly the chap I talked to said they'd never been busier in terms of business demand. I gather the onset of the recession has led people to start making more things for themselves rather than paying other people to do it for them. On the media front their only supplies seem to be pens, ink and printmaking presses. I picked up a couple of Zif archival lightfast pens - in sepia ink - which are quite difficult to track down. 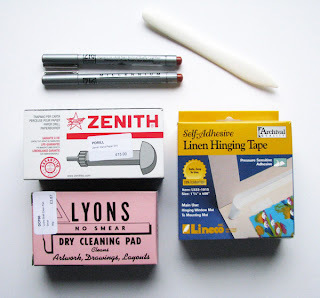 I came away with a small haul of supplies which will be the subject of future reviews on this blog. 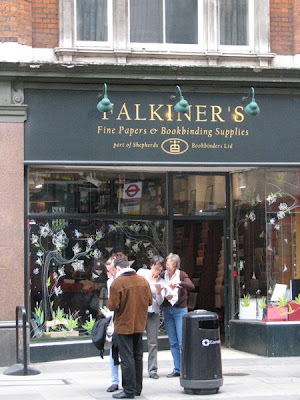 This is a shop which the paper and/or bookbinding fanatic should definitely visit if they live in or are visiting London. It has an excellent range of suupplies and very helpful staff - basically it's the stuff of dreams! 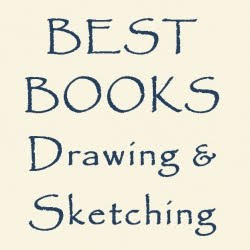 For everbody else you'll just have to make do with the very well organised and well illustrated online store! Do you have problems finding art shops or sites providing artist supplies or just anywhere that has got that illusive item that you want. Do you forget who stocks which range? This site provides details about where to find fine art materials and art supplies in and around the UK. It shares details of online suppliers and the locations of retail shops and stores that you can visit as a retail or trade customer. A gem of a find, thanks Katherine. How I'd love to be able to just walk in. Definitely next trip to London, meantime I'll be on the lookout for someone driving to Tuscany to transport my order. Such a pleasure to browse the website. 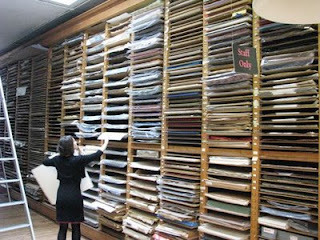 Oh Katherine, I want to come back to London to see the bookbinding supplies and paper. Thanks for taking me there virtually. Thank you for your nice comments and for noticing our hard work to keep the fine paper ranges going. We are always glad to hear our customers are happy. Hope to see you in the shop again soon!